St. Paul business owner Diane Brennan speaks in support of a citywide earned sick time policy at a press conference before a public hearing on the issue. 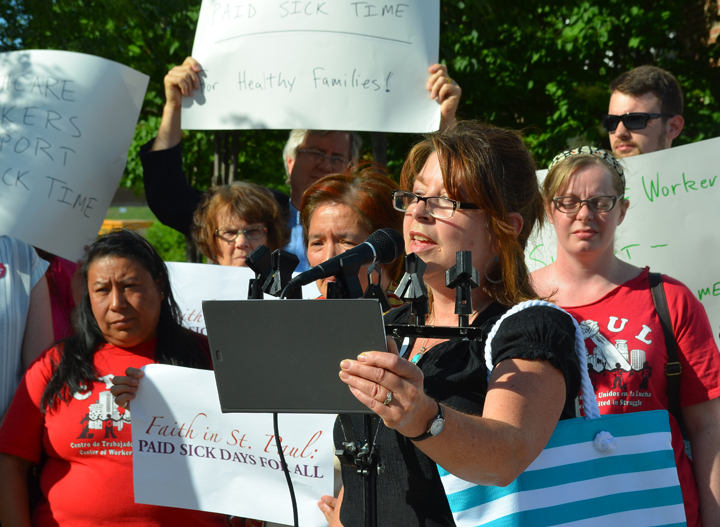 Members of the St. Paul City Council today voted 7-0 to pass an ordinance hailed by working people, small business owners, clergy members and other advocates as the strongest earned sick and safe time law on the books nationwide. Mayor Chris Coleman immediately indicated he would support the ordinance, making St. Paul the 35th U.S. location to pass sick-pay legislation, according to Family Values at Work. Set to take effect July 1, 2017, the ordinance will extend ESST benefits to an estimated 72,000 working people in St. Paul. It requires all employers – regardless of size, unlike the ordinance passed in Minneapolis earlier this year – to provide one hour of sick time for every 30 hours an employee works, with sick-time earnings capped at 48 hours per year. Employees will begin accruing sick time after working 80 hours, and they become eligible to use the benefit after 90 calendar days of employment. Supporters like Nuurto Mohamed, a janitor for 3M in St. Paul, said the new ordinance will give healthier choices to working families like hers. The ordinance also gives employees the right to sue if they face retaliation for using their paid sick time. Michelle Parker, a member of Neighborhoods Organizing for Change who works at Papa John’s in St. Paul, welcomed the enforcement provision. 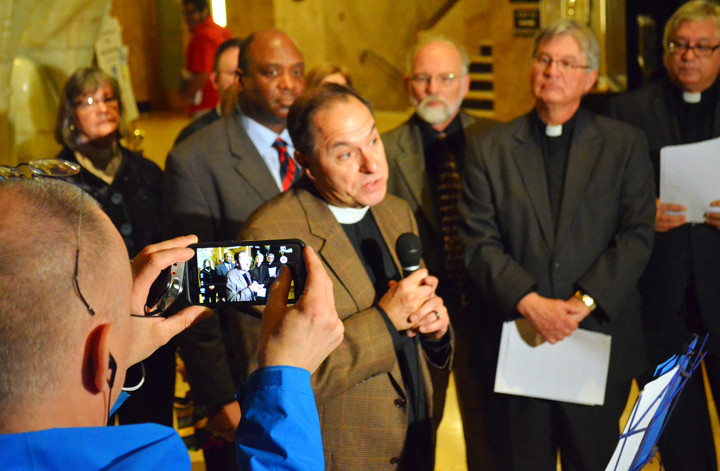 Pastor Bradley Schmeling explains his support for a citywide earned-sick-time ordinance during a press conference at St. Paul City Hall. The ordinance closely follows the recommendations of a task force established earlier this year by Mayor Coleman and council members to study the issue. It included labor, faith and community leaders, as well as representatives of the Chamber of Commerce and small business owners. Supporters celebrated the council vote as the culmination of a yearlong campaign that included congregational meetings, forums, door-knocks, phone banks, strikes, rallies and meetings with elected officials.